Creativity Raynaldo Handoko of Semarang deserves two thumbs up. How not. Only with machines Kawasaki KZ-200 Binter Merzy gift of a friend who is now in Australia. Modified BJM members who are also traders of variation, accessories importer and builder of this engine is also able to build a cool ProStreet chopper. Raynaldo here, which is familiarly called Han-Han, to exploit existing ideas in his brain. The choice, the style of the genre masterpiece of American chopper style. "The idea is to see from the plots Chica Custom Chopper, United States," he explained. He relied on in creating handmade. Start of frame, body, taped up trappings variations. In addition, he has cultivated a strong and terkonsep details. Almost all sides until Footstep, standards, and the brake lever is formed through captivating taste. "His name is also handmade, we become more flexible in creating," he explained. To order constructed of pipe schedule 3/4 dim neatly formed and measured precision. Because, rather than merely being pursued beautiful, but can be worn comfortably. "Do not get in a good shape, but when it climbed only baseball center because of faulty design," added Han-Han. Anaconda wearing body resembling a galvanized plate. Technically, the cultivation of 0.8-mm plate material was quite complex. Have to be patient and neat and symmetrical because not enough just to set up master and print like fiberglass. "That's where his art. In addition to consideration as well as connect the body from front to back, it must seem sturdy plastic and does not impress," why choose disposable plates. 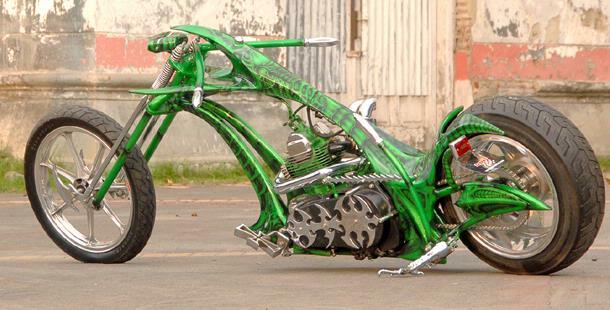 Another performance of the work of the prominent Han-Han, see the distinctive exhaust design tastes of the chopperis. Two short lengths of pipe bending slope at the side of the machine. Then, air filter, swing arm, and several sharp curves dominated motor side, supporting the body design of Anaconda. Belum ada tanggapan untuk "Chopper Anaconda"